Most people who have a passing acquaintance with African music are familiar with juju music from Nigeria, and its most famous practitioner, King Sunny Ade. If they've done a little more exploring they've probably come across the music of Ebenezer Obey, I.K. Dairo or Dele Abiodun. During his 1970s glory days Adekunle's Western Brothers band (later renamed the Supersonic Sounds) was the proving ground for numerous juju musicians, notably Segun Adewale and Sir Shina Peters, who have acheived far more fame internationally than their mentor. He issued numerous popular recordings during that decade, his output slowing during the 1980s. After 1990's People!!! (Ibukun Orisun Iye MOLPS 118) little has been heard from him. His decline in popularity seems to parallel the declining fortunes of juju itself. 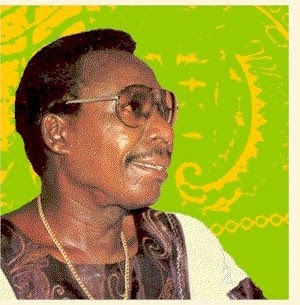 In the hopes of giving more attention to this unjustly neglected artist, I present here a sample of recordings by Mr. Adekunle, all from the late '60s or 1970s. With the exception of the 1975 selection, these are taken from cassette reissues rather than the original vinyl. The sound quality, though, isn't too bad, and I think you'll agree that the musicianship more than compensates for any deficiencies.